A dental bridge is also known as a fixed removable denture. These bridges can be supported by natural teeth, implants, or a combination of both natural teeth an implants. There are several benefits to bridges such as restoration of your smile and ability to properly eat and speak, maintenance of the shape of your face, replacement of missing teeth, and prevention of natural teeth from shifting in position. Dr Michael Clark Dental Bridge Dentist in Pine Bluff. The most common type of bridge is the traditional bridge. 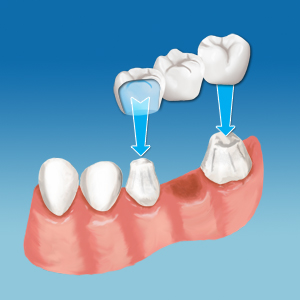 A traditional bridge is created when a crown is made for the tooth or implant on either side of the missing tooth, then placing a false tooth in between the crowns. These crowns, also called caps, can be supported by natural teeth or implants. Traditional bridges are typically made of porcelain fused to ceramics or metal. Dr Michael Clark Pine Bluff Dentist can help your Dental care with a Dental Bridge. Cantilever bridges are another type of bridge. This is created when the bridge is held by one crown on one side of the false tooth because there is not an adjacent tooth on the other side to hold the bridge. Another type of bridge is a Maryland bonded bridge, which consist of “wings” on each side of the tooth. The wings are bonded on your existing teeth and the false tooth is bonded to the framework. This bridge is also called the resin-bonded bridge or an acid-etched bridge. Dr. Mike Clark in Pine Bluff, AR want to answer all questions related to dental bridges. Call today to schedule an appointment!